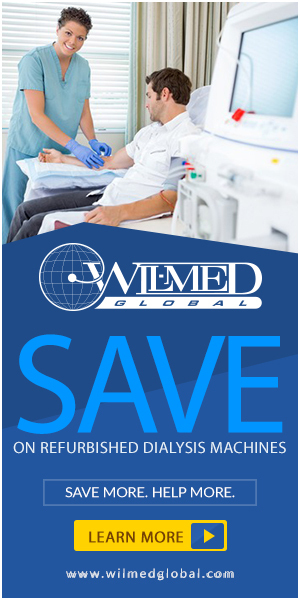 Dialysis facilities are designed to do one thing, and do it well—provide dialysis to patients with end-stage renal disease (ESRD). But there are many ways to accomplish this seemingly simple task, and the most successful facilities are those that maximize patient care and comfort. Patients, of course, are attracted to the dialysis facilities that will best serve their needs, and it behooves the savvy dialysis center to provide the most lavish, relaxing setting possible. Maximizing patient comfort can be done simply—with adjustments such as adding comfortable waiting rooms for family members, improving ventilation and providing patient control over temperature, adding space between dialysis chairs, or offering additional privacy. These changes do not all necessitate a large investment; in fact, the simplest alterations can bring the facility revenue worth many times the cost of the modification. DaVita, for example, offers new dedicated self-care facilities, which incorporate a unique design to improve patient satisfaction. The company’s treatment options represent a continuum of care, said Terry Rowe, vice president of center development for DaVita. “These options include home hemodialysis (HHD), peritoneal dialysis (PD), nocturnal dialysis, in-center self-care dialysis and traditional chronic hemodialysis. The traditional modalities—HHD, PD, chronic and nocturnal—are familiar to most in the renal community, but in-center self-care is relatively new. At DaVita, in-center self-care means a patient is actively involved in a significant portion of his/her care, and is supported by the DaVita clinical care teammates and, in some cases, the patient’s care partner,” he added. To facilitate the patient’s ability to move along the care continuum, DaVita has created two innovative partnered-modality facilities, which they call “In-Center Self-care—Multi-Modality Centers.” Each of these centers supports HHD, PD, nocturnal, in-center self-care and traditional chronic hemodialysis. The facilities were created to enhance each modality by offering special features and the convenience of one central location. They are also meant to foster patient independence in a relaxing and rejuvenating environment. The most recent of these centers is located in Las Vegas. “It features a stacked stone veneer entrance and lobby area, soft paint colors and wall coverings, wood-look floors and solid surface countertops,” said Rowe. In addition, in order to foster their independence, the facility does not require self-care patients to check in or wait; instead, they have a separate entrance that opens to their patient lockers. To the left of the patient locker area is the patient prep area, which includes a sink for washing hands and accesses, and also includes the scale. In the self-care treatment area, patients have access to individual self-care suites. These are private glass suites, larger than traditional dialysis spaces, to reinforce independence, accommodate learning and allow room for a care partner if the patient chooses to have one. The HHD training suites in the Las Vegas center also facilitate individual training and feature retractable partitions for group sessions, added Rowe. And in the nocturnal suites, patients may choose to use the oversized dialysis chair that accommodates a nocturnal sleeping pad or the Murphy bed available in every nocturnal suite. All of these suites have indirect lighting and, with the exception of the nocturnal suites, each has its own window. Every suite has an individual flat-screen TV and is wired for high-speed Internet. Even though the in-center self-care suites are designated as HHD, PD or nocturnal, they are all multi-functional and can accommodate any treatment modality as necessitated by the day’s census. Additional features of the self-care part of the center include a nutrition bar area with refrigerator, a medication prep area and a telemetry monitoring station. Not every change has to be something patients can see and touch. Tighe Wilson, president of Wil-Med Global, Inc., said that the main point of interest he discusses with patients — and sees in facilities — is the concept of patients getting clear answers and feedback with their treatments. This doesn’t have to cost the center a penny. Instead, if staff members can simply take the time to provide individual attention to each patient, they will find that the patient’s satisfaction improves dramatically. Clinic design can always be improved upon, too. If possible, Wilson suggested, give the patients access to newer technologies. “The extra space and the wiring for cable and the computer hookups are wonderful, [because they improve the provision] of information and/or communication during treatment. The extra space allows some additional privacy and adds to the comfort level for the patients,” he said. The most desirable clinics, he continued, are the ones with positive and caring staff members who go that extra mile for the patients when possible. “I take my hat off to all of the ESRD staff in North America who work so very hard to truly give the best patient care and the long days everyone puts in to accomplish this goal,” he said. Renal Business Today asked the American Association of Kidney Patients (AAKP) if some of their members would be willing to share their own insights for facility improvement. Following are some of their suggestions. David O. Stapel, who receives in-center hemodialysis in Halton City, Texas, told us he would like to see automatic self-opening pocket doors (doors that slide sideways) in the entrances to the waiting room and the treatment areas of dialysis facilities. “This is to accommodate wheelchairs, walkers, etc.,” he suggested. Stapel also would like to see lockers made available for patients to store blankets, pillows and other supplies. In addition, he requested comfortable chairs for dialysis patients. “The old reclining chairs (La-Z-Boy style) with an abundance of padding are best! Chairs that vibrate would be an added feature,” he added. Not only that, but each treatment station should have a small table equipped with telephone, Kleenex, etc., similar to a bedroom nightstand. And finally, he said, the walls of a dialysis center should be painted in cool, relaxing colors. “Avoid white and gray, and use attractive wall hangings, which add to the soothing atmosphere,” he proposed. Ruth, a 60-year-old hemodialysis nurse and patient in Alabama, had some other ideas that would be inexpensive and easy to implement. “It would be nice to have a covered area for patients to drive under when the weather is bad,” she suggested. Another positive addition might include a welcome sign to let patient know that they are more than just someone to sit in a chair. AAKP president Roberta Wager, RN, MSN, also asked patients what their ideal dialysis center would look like, and in addition, received responses from nurses and technicians who work with dialysis patients every day. First, the staff members suggested, each patient should have his or her own computer in their area—to input treatment, data, etc. (an infection control issue). Second, they should have sinks with a good flow of water—not water just sprinkling out a little at a time. Third, the nurses and technicians would like to see plenty of space between patients. This improves privacy and is helpful in case a patient codes, because equipment can get in and out of the area more easily, they said. Another surprising tip was the addition of individual trash cans to each station, so that staff members do not have to move one trash can around to different patients. And new chairs would be a bonus—the right size chairs for patients that are not too low, so nurses and technicians do not have to stoop so far to stick patients’ access sites, etc. And another tip that might require some rearrangement of each patient station is making sure that electrical sockets in the walls are easily accessible to staff. As for the patients Wager spoke to, “Most of them commented on quantitative needs—such as why the clinics must look at the patients as numbers—and albumin numbers, KT/V numbers, phosphorus numbers, Hgb numbers, and potassium,” Wager said. “The clinic staff is so concerned about meeting ‘the numbers game’ that they forget the human aspect of the patient. If patients do not meet the goal (numbers), then they feel like they are being lectured, talked down to, etc.,” she added. Additional input was provided by Brenda Dyson, past president of AAKP and patient services coordinator for Network 8 Inc. in Jackson, Miss. She is a transplant recipient and, in the past, has experienced home hemodialysis and in-center hemodialysis. Televisions should be individual with patient earphones so as not to interrupt others including technicians, other patient, or RNs. Finally, Lambert said, a separate floor should be in the building for positive patients, and should include two to four chairs (depending on average need) in the area, with at least one RN and one technician on staff at all times. Also necessary is a separate area for home dialysis patients’ training and checkups, with individual rooms for training, similar to the home environment. Although some of these changes can be quite expensive, many others can be implemented with a minimum of cost to the clinic while maximizing their return in customer satisfaction.